Article first published as Baked Dijon Salmon on Blogcritics. By far, our favorite fish is salmon. There's so many wonderful ways to prepare it and I've been having so much fun trying out new recipes with the fresh salmon I've had lately. The newest recipe I tried was for this Baked Dijon Salmon. It had amazing flavor from the buttery Dijon honey sauce that's spread over the fish to the crispy topping of panko breadcrumbs, chopped pecans and fresh parsley. All the flavors worked so well together and didn't take away from the salmon, but rather enhanced it just enough for a hint of sweetness. I'm anxious to prepare this recipe using other fish such as cod or even tilapia. There's something that works so well with Dijon mustard, honey and pecans that I'm even tempted to try this with chicken! The preparation is simple and you can definitely have dinner ready in less than 30 minutes. I really liked how easy it was to put together and when served, it seems so elegant and involved when really that's hardly the case. I'll have to report back to see how this recipe works out with other fish and chicken... but regardless, this salmon was outstanding and I'm definitely making it again! In a small bowl, stir together butter, mustard, and honey. Set aside. In another bowl, mix together breadcrumbs, pecans, and parsley. How delicious this must have been. 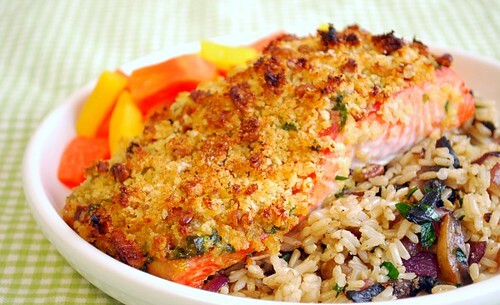 Love the flavors and really feel Panko is the way to go when topping fish. Stunning photo-Yum! That rice looks very tasty also, would you share that as well? Thanks! My favorite also and this recipe looks fantastic! I make this salmon all the time. It's delicious. Salmon absolutely is my favorite. i just lobe the look, color and taste . Your photos and presentation are over the top, sounds fabulous! This looks amazing. I love me some salmon. I agree with Melly-- that rice looks amazing! PLease do share the recipe! Thank you Melly & Julia! The rice is really simple - steamed brown rice with caramelized red onions, mushrooms and chopped fresh parsley mixed in. While the brown rice is cooking, I sauté the onions and mushrooms in a pan with a little butter until browned and caramelized. I fluff up the brown rice and add in the onion/mushroom mixture along with chopped Italian parsley, tossing to combine. Voila!